Stay in touch with the preparations for the Air Forces centenary year via the website. Additionally, you can connect with the centenary planning team, or sign up to receive updates via email. Along with artist Norman Clifford, RAAF Association stalwart Lance Halvorson has produced a magificent book, ‘The Australian Flying Corps in the Great War 1914-1918. What’s Left on the Air Force Checklist To Make F-35s Operational? Today, (Thursday 25 February 2016) the Prime Minister and the Minister for Defence released the 2016 Defence White Paper, accompanied by the Integrated Investment Program and Defence Industry Policy Statement. The 2016 Defence White Paper sets out the Government’s comprehensive long-term plan for Australia’s defence. The Government has directed a new Defence strategic policy framework in the White Paper that set out what Defence must be able to achieve. The Government’s Strategic Defence Interests and three equally weighted Strategic Defence Objectives replace previous strategic guidance. We must move quickly to align our efforts with the Government’s new direction across our operational and international engagement plans. The Government is making a significant investment in Defence. The Government will grow the Defence budget to two per cent of Australia’s Gross Domestic Product by 2020-21, increasing the Defence budget from $32.4 billion in 2016-17 to $58.7 billion in 2025-26. This funding will enable significant investment in the Australian Defence Force’s (ADF) ability to operate as a joint force and in the Defence enablers essential to maximise the force’s effectiveness. The Integrated Investment Program released with the Defence White Paper replaces the Defence Capability Plan. The Integrated Investment Program brings together, for the first time, all capability-related investments, including platforms and systems; Defence estate, such as ADF bases, facilities and training areas; information and communications technology; science and technology; and workforce elements. The Integrated Investment Program is the Government’s direction on Defence capability planning in Defence. It is not discretionary. We must ensure that we work to implement the Investment Program in full, and properly to deliver on the Government’s plans. The Defence workforce will increase and rebalance over time to achieve the Government’s plans in the White Paper. The permanent ADF will increase to 62,400 by 2025-26. New positions will be created and existing positions will be reallocated to higher priority areas. The future Australian Public Service (APS) workforce will be maintained at 18,200. Within this workforce, 1,200 new APS positions will be created over the next ten years. The majority of new positions will be in intelligence areas, including counter-terrorism, cyber security and space-based capabilities. The Defence Industry Policy Statement recognises the fundamental contribution that Australian industry and science and technology research organisations provide to Defence capability. In the next month, we will provide details of the White Paper Implementation Strategy, which will be closely aligned with the First Principles Review. The Defence Committee will be accountable for delivery of the White Paper Implementation Strategy. Please take the time to read these documents and discuss them with your supervisors and colleagues. “the yawning gap between many elements of Defence industry policy and its implementation as experienced by Australia’s defence industry sector. The Committee’s recommendations, if implemented, will lead to a far more strategic partnership between Defence and industry that will mean better, more affordable capability for Defence and sustainable work for industry. The Committee’s starting point was accepting the evidence provided during this inquiry-and validated by recommendations of the First Principles Review-that elements of defence industry are essential to Australian Defence Force capability. Defence therefore has an interest, indeed an obligation to identify elements in industry that are fundamental inputs to capability (FIC) and then to use available means-including domestic procurement programs and support for exports-to enhance and sustain them. Achieving this will need a change of culture. Defence need to move beyond their reluctance to partner with industry and develop a culture of early engagement to understand and manage risk. There needs to be an acceptance that for some complex systems, value for money may be found more often in long term partnerships than defaulting to ongoing, open competition for an off-the-shelf product or service. Senator Fawcett (senator.fawcett@aph.gov.au) has advised that he would welcome questions or comments about the report. 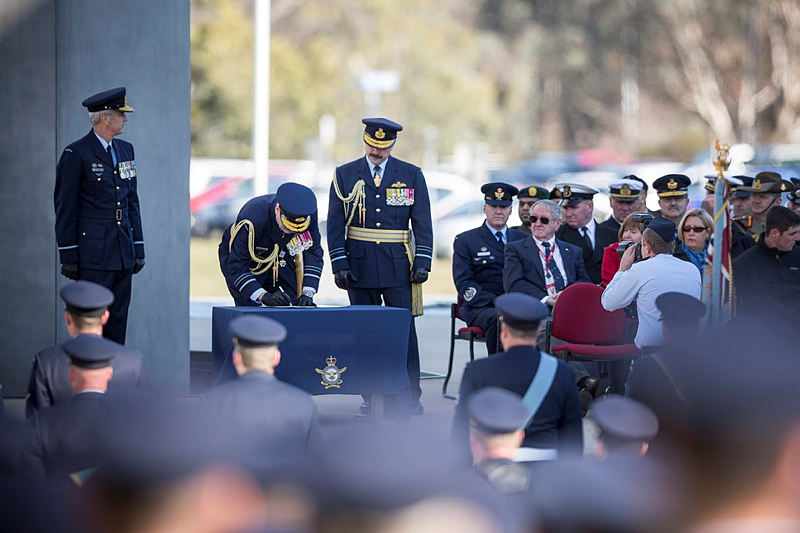 The Chief of Air Force, Air Marshal Leo Davies, AO, CSC officially launched ‘Air Force 2021’ – planning for the centenary of Air Force during a ceremony at Fairbairn on Tuesday 17 November 2015. Speaking at the event, he said it was important for the Australian community to be involved. Air Force’s vision for the centenary is a program of carefully selected events and initiatives that will honour the sacrifices and contributions of the last 100 years, demonstrate today’s highly capable force, and foreshadow our continued evolution into the future. Former Chief of Air Force, Air Marshal David Evans, AC, DSO, AFC (Ret’d), Air Commodore Catherine Roberts, CSC and two junior Airmen, Leading Aircraftwoman Emma Chapman and Leading Aircraftman Mason Gow spoke about the Air Force’s future and how it will effect them in 2021. 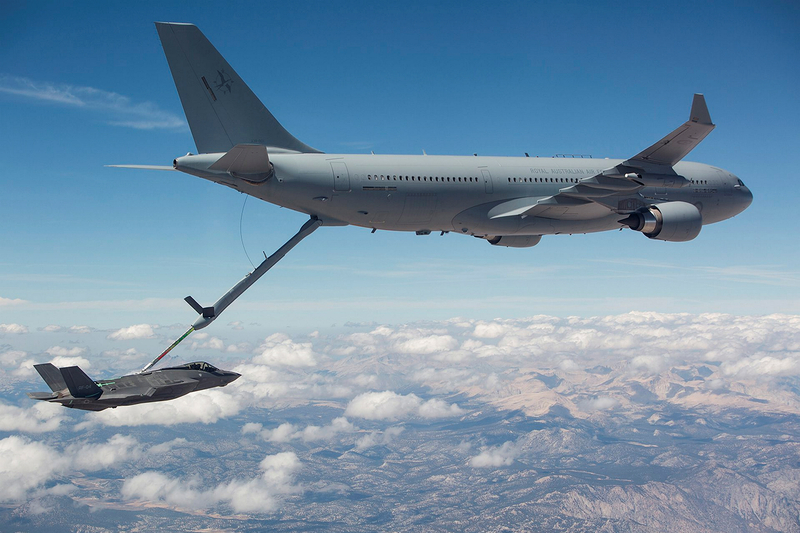 The Royal Australian Air Force (RAAF) has completed the first fuel transfer with the air refuelling boom from a RAAF KC-30A Multi-Role Tanker Transport (MRTT) to a US Air Force (USAF) F-35A Joint Strike Fighter at Edwards Air Force Base in California. A total of 59 contacts were conducted of which five contacts transferred 43,200 pounds of fuel during the four-hour sortie. Chief of the Air Force, Air Marshal Leo Davies AO CSC, described the trial as a significant step in the development of the KC-30A’s capability. “Our KC-30A is an essential force multiplier. Mid-air refuelling is critical to ensuring global reach for our aircraft, our people and our equipment,” Air Marshal Davies said. “Refuelling between the KC-30A and F-35A is an important step towards the KC-30A’s achievement of Final Operational Capability (FOC) and represents continued progress in the development of the F-35A. 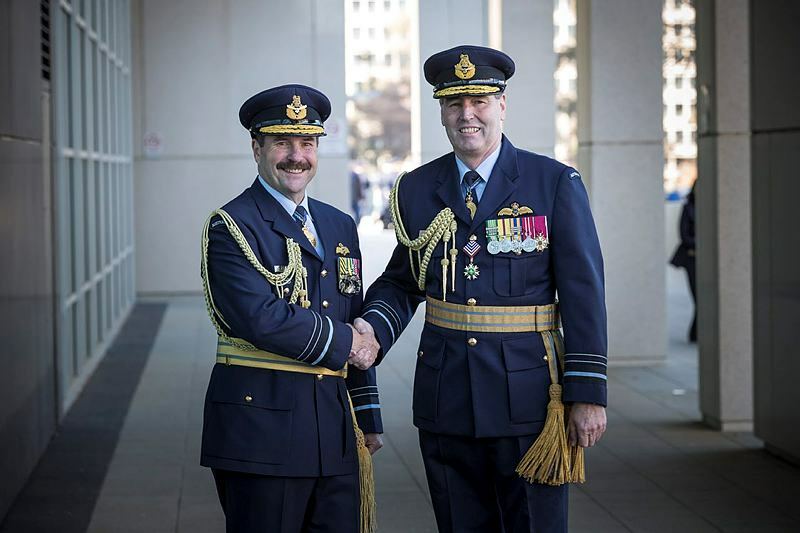 “This achievement is significant because the future of Australia’s air combat capability is reliant on the successful partnership between these two aircraft and our ability to be interoperable with our international partners,” Air Marshal Davies said. The KC-30A has two refuelling systems – the hose-and-drogue and Advanced Refuelling Boom System (ARBS). The two different refuelling systems allow RAAF to support a wide range of coalition aircraft on Operation OKRA where a KC-30A is currently deployed to support combat operations against Daesh in Iraq and Syria. The five KC-30As are based at RAAF Base Amberley (QLD) and Air Force will receive an additional two in 2018. A single KC-30A can carry a fuel load of more than 100 tonnes and remain 1800 kilometres from its home base with 50 tonnes of fuel available for offload, for four hours. Australia has committed to 72 F-35As for RAAF Bases Williamtown and Tindal, with the first aircraft arriving in late 2018. The F-35A will replace the ageing F/A-18A/B Hornet with a 5th-generation networked fighter aircraft. One of our lost trails has been resolved with the sad advice from RAAFSCA member Pete Hayes (32 Course) that Wing Commander Daren Greenwood passed away at Faulconbridge in the NSW Blue Mountains on 6 November 2014. The link above contains a dot point summary of a eulogy delivered at Daren’s funeral. Support from the sky – how will the UK replace Nimrod? AVM Jim Flemming passed away in Canberra on 11 Feb 15. He joined the Air Force in 1943 and retired in 1982 . AVM Jim was the inaugural Vice President of the Association, the ACT Representative (in the days when we had a representative from each state and territory on the Executive) and Trustee. Before the Association was formally founded in 1991 AVM Jim was on the Steering Committee established in 1990 to draw up the Constitution and develop the proposal to form an association which was put to RAAFSC graduates at the 1991 reunion. He is survived by his wife Pat and their three children Peter, Geoffrey and Terese and their families. ADF star rank appointment and promotion lists were released in December 2014 and January 2015. Wing Commander A.E. ‘Ted’ Ilton passed away on Saturday, 25 October 2014 on the Gold Coast, Queensland. His funeral was held on Monday, 3 November 2014. Ted’s funeral notice in the Gold Coast Bulletin noted “Your two great loves family and the RAAF”. Ted Ilton was a graduate of the RAAF’s No. 22 Advanced Staff Course in 1968. Amongst his fellow 22 Course graduates are current Association members AVM Ken Tuckwell (President 1996 – 2003), AIRCDRE Ted Whitehead and WGCDR Tom Johnson. Ted sparked the genesis of our Association after his retirement from the RAAF. At one annual College reunion in 1987 he noted that attendance by graduates had fallen dramatically and he took it upon himself to remedy the issue. Ted in his usual methodical way prepared a paper in April 1989, entitled “Should an Old Boys Union be formed for Reunion Management and Other Associated Old Boy activities”. Ted then instigated the gathering of address details of graduates – a gargantuan task. Initially he obtained from Staff College the nominal rolls for Courses No.1 (1949) to No. 42 (1988). He manually sorted these names into an alphabetical master roll as he had no electronic database functionality and after many months he had a workable nominal roll of some 1200 graduates. At the 1990 reunion a steering committee was formed to progress the formation of an association. At the 1991 reunion the Association was founded and a constitution adopted. After some four years of intense effort Ted had achieved his aim. During this process two of our Association members, Noel Montgomery and Jim Huet, in their capacities as College Commandant, provided Ted with much assistance. Ted was elected as the inaugural President of the Association and continued in this position until he retired from office at the 1993 AGM. Living in Queensland Ted was not always able to attend the annual reunions in the later years but he was there in August 2001 to attend the unveiling of the Staff College memorial plaque in the Group Captain Hughie Edwards VC Memorial Park, RAAF Memorial Grove, on the Federal Highway. Ted’s legacy is continued today with our Association being the only single Service staff college association in operation and, with graduates and DS from the joint Australian Command and Staff College now able to join, the Association continues to flourish. Our meeting on 17 Oct 14 coincided with a double anniversary for Canberra. On this day in 1960, the Department of Air began to occupy its permanent offices at the Russell Hill Defence precinct in the national capital, a move expected to take three working days. Building No 1 was the first of four office blocks under construction on the site, and was planned to house the Air Staff and Secretariat of the Department of Air. The rest of the Department would occupy a second building scheduled for completion by May 1961. Over 200 members of staff already working in the Administrative Building in nearby Parkes began the move, along with a further 120 (being the remainder of the Air Staff and Secretariat, together with the Directorate of Works and Buildings) who transferred directly from Melbourne. Until the second building was ready, the Department remained split between Russell and Parkes (where the Air Member for Personnel and his staff were staying), and Victoria Barracks in Melbourne. On this day in 1964, Prime Minister Menzies declared the recently filled Lake Burley Griffin as being ‘duly inaugurated’. Subsequent to the release of the above media statement, the second RAAF F-35A has also flown. See video of the first aircraft’s maiden flight. Our guest speaker from March this year, Senator David Fawcett has written an opinion piece regarding the Future Submarine (SEA 1000). Subsequently in the Senate he has outlined some more detailed reasons as to why Australia needs to develop the sovereign capacity and competence to manage our submarine capability and why building the submarine in Australia may be the most cost effective way to achieve it. The text of the speech is in Hansard or if you prefer, you can watch it online. Senator Fawcett has indicated that he would welcome any feedback you may have on his position on a sovereign submarine capacity. The Government is preparing to contribute to an international coalition to counter the ISIL terrorist threat. The Australian Defence Force will prepare and deploy to the United Arab Emirates up to eight Royal Australian Air Force F/A18 combat aircraft; an E-7A Wedgetail Airborne Early Warning and Control aircraft; and a KC-30A Multi-Role Tanker and Transport aircraft. In addition, the Australian Defence Force will prepare a Special Operations Task Group as military advisers that could assist Iraqi and other security forces that are taking the fight to the ISIL terrorists. Australia will place Australian Defence Force personnel in the United States Headquarters to ensure close coordination with our alliance partner and to support planning and logistics. We are not deploying combat troops but contributing to international efforts to prevent the humanitarian crisis from deepening. The Government’s decision responds to a formal request from the Government of the United States to contribute specific Australian Defence Force capabilities to the international coalition. In recent days, I have discussed the situation with President Barack Obama, with Iraq’s new Prime Minister Haider Al-Abadi and with Crown Prince Sheikh Mohammed bin Zaiyed of the United Arab Emirates. These leaders share the Government’s grave concern about the situation in Iraq and support Australian participation in an international coalition to disrupt and degrade ISIL’s ruthless advance. The ISIL death cult threatens the people of Iraq, the region and the wider world. The conflict has reached out to Australia, with at least 60 Australians fighting with ISIL and other terrorist groups and another 100 or so supporting these extremists. This situation is as much a matter of domestic security as it is of international security. It is right for Australia to do what it prudently and proportionately can to support international efforts to prevent the spread of ISIL, roll back its gains and alleviate suffering in Iraq. Australia has already provided air-lift assistance to Iraq, including the movement of arms and munitions and two humanitarian aid drops to stranded people in Northern Iraq using a RAAF C-130J Hercules and C-17A Globemaster aircraft. I am encouraged by the strong support President Obama’s strategy has received, in particular from Iraq and many neighbouring countries, and the wider international community. On 24 September, I will attend the United Nations Security Council to further discuss the international effort to counter ISIL. 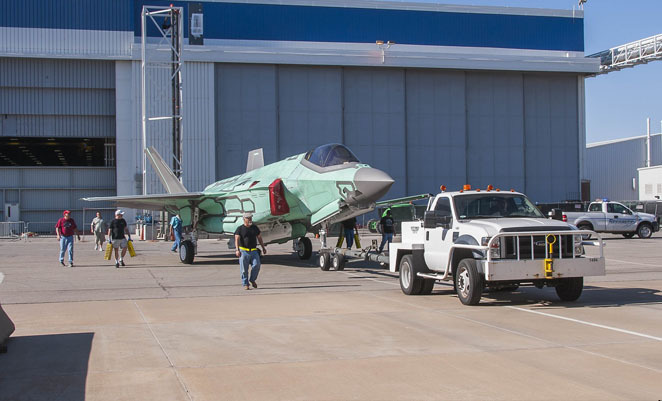 The latest edition of the online Australian Aviation has images of the RAAF’s first Lockheed Martin F-35A Lightning II being towed from the production line to the paint facility. The aircraft, dubbed AU-1 and appearing in primer colours, is due to be officially rolled out in July and delivered to the USAF’s Integrated Training Center at Luke AFB in Arizona later this year. The Centenary of Military Aviation airshow was held at RAAF Point Cook on the first weekend of March, 2014. The Saturday of the 1st March was the 100th anniversary of the first military flight in Australia, when a Bristol Boxkite first flew from the Point Cook airfield. The airshow, with its emphasis on historical aircraft, was a proper tribute to the many thousands of Australians who served in the RAAF, and earlier Australian military aviation formations, over the last century. High quality display flights in a range of aircraft were performed by RAAF and guest pilots, in a range of aircraft, from the RAAF Museum’s 1914 Bristol Boxkite replica, through to contemporary RAAF aircraft. This photoessay depicts historical RAAF aircraft, and some allied types, through to the Vietnam War era. Bristol Boxkite photos were generously provided by AIRMSHL John W. Newham AC, RAAF (Retd). “A good result for DFRDB over 55 recipients after a long campaign. The under 55 DFRDB and MSBS recipients are next on the agenda and I anticipate a drawn out battle. The Government’s FIB has been passed in the Senate today (27 March 2014). This means that the implementation for those superannuates covered by this Bill will be effective from the 1 July 2014. ADSO thanks the Coalition Government for implementing their 2010 pledge and congratulates all, especially Sen Michael Ronaldson for championing the case, and all those who were involved in contributing to this result. While pleased with this success, ADSO regards it as a first step to the achievement of the same fairness for those excluded from this Bill: namely, DFRB/DFRDB superannuates under aged 55 years, and MSBS members. Minister for Veterans’ Affairs, Senator the Hon Michael Ronaldson, and Assistant Minister for Defence, the Hon Stuart Robert MP, today (27 March 2014) welcomed the passage of the Defence Force Retirement Benefits Legislation Amendment (Fair Indexation) Bill 2014 through the Senate, giving effect to the Government’s commitment to give veterans a fair go. “Thursday 27 March 2014 is a day for fairness. Today, the Government fulfilled its pledge to give veterans a fair go. We made a promise and we have kept it to the letter”, Senator Ronaldson said. Assistant Minister for Defence, the Hon Stuart Robert MP, said that from 1 July this year military superannuants and their families would benefit from the change in indexation arrangements. “By passing this legislation today, veterans and their families have finally been delivered the fair go that they deserve, and that they were promised”, Senator Ronaldson and Mr Robert said. The above link contains some elementary but well reasoned arguments for an independent air force. The argument rebutted by the article is also linked within the article. 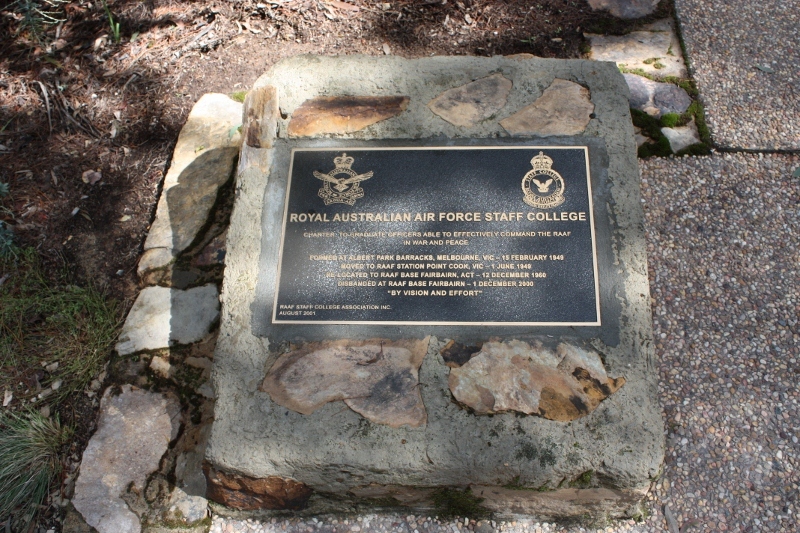 Thanks to the good offices of GPCAPT Peter “Norf” Norford, (then Chief of Staff at ACSC), the RAAF Staff College Association’s original plaque is now at the RAAF Museum where it will be refurbished and displayed for all to admire. Watch this space for further news about the grand reveal! Further reporting on the F-35 Joint Strike Fighter and a link to the ABC Four Corners report on iView is at: http://www.abc.net.au/news/2013-02-18/pentagons-doubts-on-joint-strike-fighter/4524962. The photos below show progress with the refurbishment of the Association’s plaque at the RAAF Remembrance Driveway Memorial (the Hughie Edwards VC Memorial Grove), on the outskirts of Canberra. Despite the best efforts of the Executive, the original plaque had deteriorated badly. With financial assistance from Lockheed Martin Australia Limited, WGCDR Ted Ilton, the founding Association President, a number of Association members, and the estate of the late WGCDR Mervyn Heinrich, the Association commissioned a new bronze plaque. The new plaque, with plain relief lettering and badges, was installed by GPCAPT Arthur Skimin. 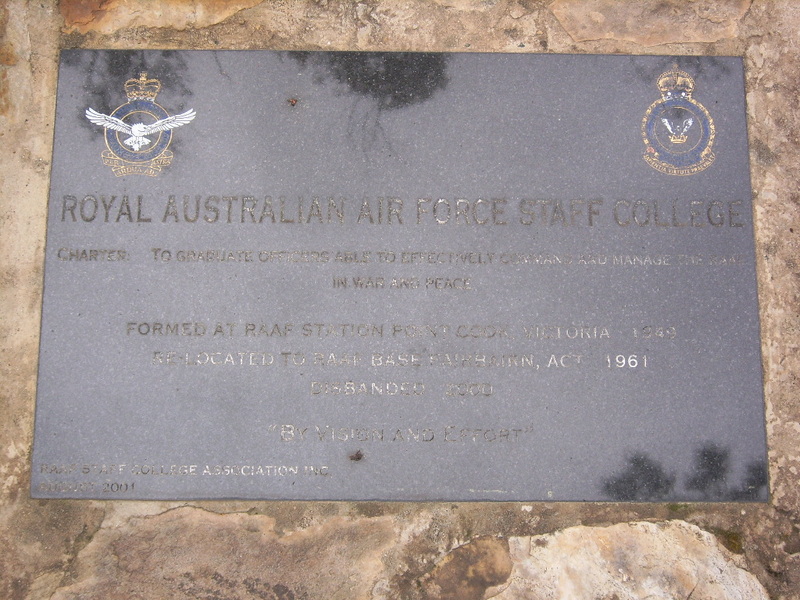 The original plaque has been offered to the RAAF Museum for safekeeping.